The bestselling core textbook on communication disorders is better than ever with this new third edition, thoroughly revised and based on updated ASHA standards. Covering a broad range of disorders and developmental levels, this text gives future professionals up-to-date guidance on evidence-based practice from more than 20 academics and working clinicians. Preservice SLPs and audiologists will get a comprehensive guide to contemporary clinical practiceâ€”one theyâ€™ll use for the rest of their careers to provide the best possible services for people with communication disorders. 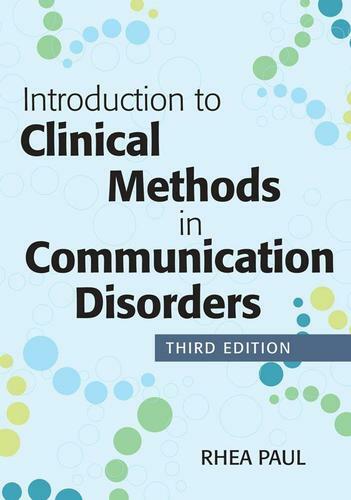 An essential text for all students in clinical methods courses and a reliable reference for practicing professionals! New chapters on assessment, the role of research in clinical practice, communication sampling procedures, and cultural diversity * Updated ASHA standards * Coverage of new legislation and regulations * New bases of evidence for the intervention chapter * Updated clinical communication chapter with more coverage of electronic records and HIPAA compliance * Expanded service delivery chapter that discusses the emerging roles of SLPs and AUDs.